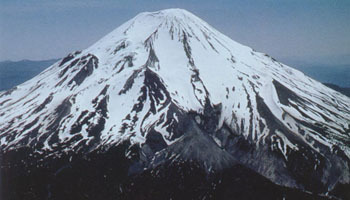 8365 ft (2550 m) 9677 ft (2950 m) before May 18, 1980 . 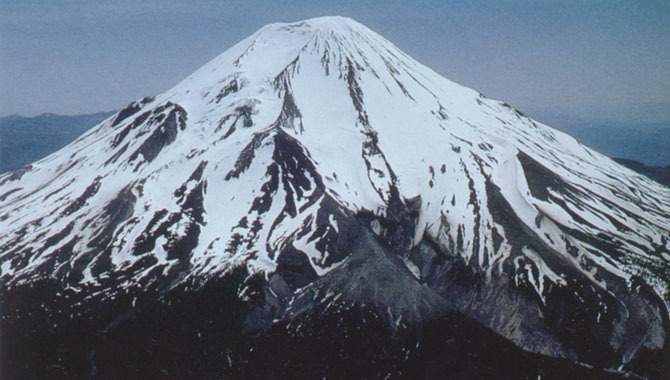 Mount Saint Helens was once the most beautiful peak in the Cascade Range, a cone whose near-perfect symmetry led it to be known as the "Fuji of America". But in Saint Helens' symmetry lay the roots of its destruction, for the graceful uneroded form was due to its status as the youngest and most active volcano in the range. 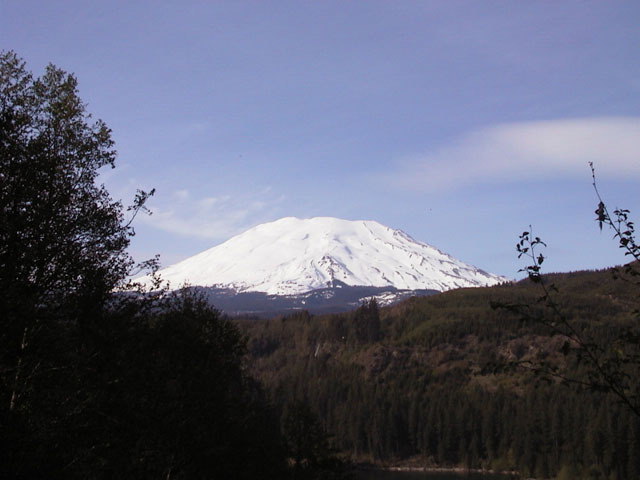 Twenty years ago, the illusions of Northwesterners who refused to believe the dire predictions of volcanologists were shattered as the volcano rumbled back to life after a century of dormancy, culminating in the catastrophic eruption of May 18, 1980, which decapitated the cone and caused massive destruction in the forests and along the rivers to its north. Sporadic eruptive activity continued until late 1986, as a massive lava dome grew in the center of the shattered crater. 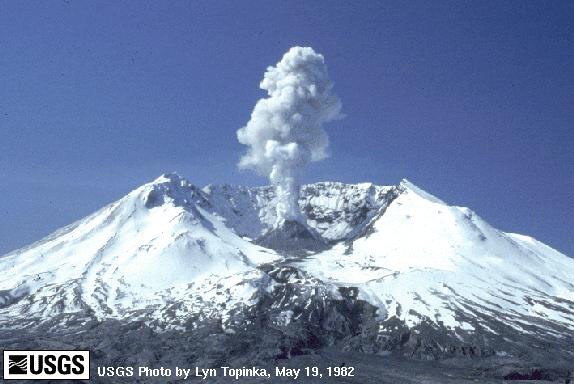 Although the crater and the devastated area to the north remain closed to the general public, the largely undamaged south side of Saint Helens was reopened to climbers and skiers in 1987. All of the routes to the crater rim are now considered non-technical, as the eruption removed the accumulation zones of the glaciers and so the remaining ice is now stagnant and uncrevassed. These routes make superb ski and snowboard outings from late fall into early summer (permits are restricted to 100 per day between May 15 and October 31, so it is best to go earlier). (19 km) This is now the usual winter and spring route, with the highest vehicle access at the plowed Marble Mountain Snow Park at 2700 ft. This straighforward route follows trails through forest and then heads directly up the valley of the Swift Glacier to the crater rim. Slopes reach about 30-35 degrees near the rim, but it is easy to ascend on skis all the way up. A scenic camp is possible near timberline at 4500 ft, otherwise the trip can be easily done in a day by car camping at the parking lot. Note that snowboarders may find ski poles useful for going down the final long, barely sloping trail back to the parking lot. (14 km) Now the standard climbing route, this is most popular in late spring and summer, since the trailhead (Climbers Bivouac) is the highest on the mountain at 3800 ft, but is not plowed out. 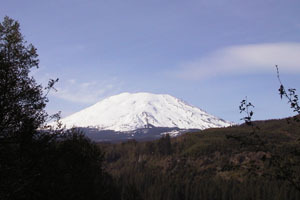 In winter or spring it is possible to ski up the snowed-in road from Cougar Snow Park at 2200 ft all the way to the crater rim, yielding the longest ski descent on Saint Helens. The slopes are generally moderate, except for a steep section near 4800 ft getting onto Monitor Ridge, and above this the slope is gentler than the neighboring Swift Glacier. A veriety of steep ski lines are available in the bowls east and west of the ridge, but these steeper exposures are prone to afternoon sluffs and avalanches. (18 km) This route starts from 3100 ft on the road west of the Climbers Bivy turnoff, heading north to the Butte Camp Dome and then climbing NE to the true high point on the crater rim at 8365 ft. Access is longer than the previous two routes at any time of year, but the upper part of the route holds a more consistent fall-line pitch than the previous two, and it is certain to be far less crowded. (13 km) Well away from the beaten path, this route follows the west ridge along the edge of the Eruption Impact Area. Access begins from the Sheep Canyon road, and given the distance along that road to reach the trailhead, this route is only practical if the road is snowfree. The pitch on the upper part seems to be about the same as the Butte Camp route. Full page descriptions and photos of Worm Flows, Monitor Ridge, and Butte Camp routes.